HIRA has more breaking news that you won't hear from official channels at the RINO-controlled Hawaii Republican Party. Hey, what's the latest with Kym Pine-Ryglowski? ( alias Kymberly Pine, Kymberly Marcos Pine, Kymberly Neaulani Pine et al). 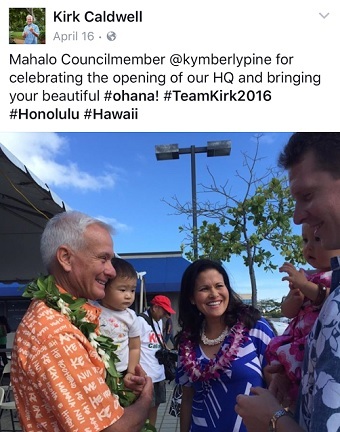 If you've been wondering about Tea Party Republican Kym Pine's role in helping the Hawaii GOP to beat Democrats in 2016, then HIRA's got the latest news for you. Pine has decided to help Democrats in 2016. That's right! She and Democrat Kirk Caldwell have been helping each other raise money in recent months for each other's campaigns. As a couple of pro-tax, heavy-rail advocates supported by Pacific Resource Partnership (PRP) and many other Democrat-aligned special interest groups, these two politicians have a lot in common. 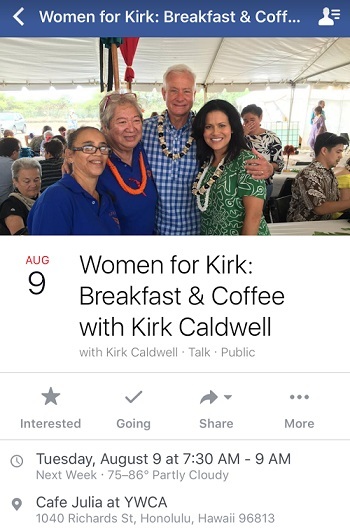 The latest episode in a string of mutually beneficial back-scratching is Pine's participation in the Caldwell campaign's outreach to women - "Women for Kirk" coming up in a few days. So has Pine officially defected from the GOP? Good question. 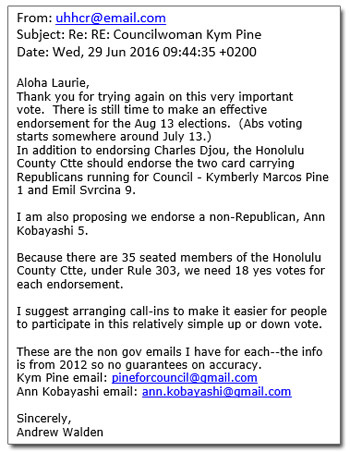 Except for the fact that Fritz Rohlfing doesn't bother to list Pine as a "Republican" elected official on the party's website next to future Democrat defector Beth Fukumoto and other elected officials who are technically still Republicans ( nor even on the party's official list of "Republicans" on the ballot in 2016), the Hawaii GOP has made no formal or informal announcement to its members about an official change in Pine's political affiliation from Republican to Democrat. Though the partisan situation now seems pretty self-evident, perhaps making such a definitive announcement would be too embarrassing this close to the upcoming General Election . . . let alone this month's Primary Election. With practically every union in town giving Pine campaign money, the rumor at City Hall is that Pine will seek Caldwell's job as mayor when both of their terms expire in 2020. At that point, these opportunistic politicians will continue helping each other; with Caldwell seeking the governorship and Pine hoping to succeed Caldwell at Honolulu Hale. Anyway, from the look on Democrat Kirk Caldwell's face above, he's probably glad that the Honolulu GOP county committee decided against endorsing Kym Pine for re-election last month, even though that was the plan pushed by party leader and blogger Andrew Walden ( who also wanted the Hawaii GOP to endorse Democrat Ann Kobayashi). 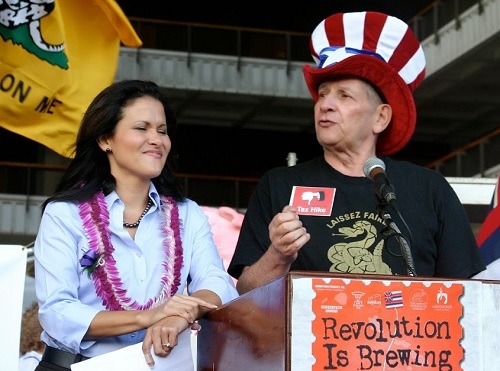 In consideration of Pine-Ryglowski's steady support for higher taxes, wasteful spending, giveaways to government employees, the runaway rail project, and the misguided creation of Hawaii's super-expensive ( and now defunct) Obamacare Connector Exchange, it's pretty obvious that she is in complete alignment with Hawaii Democrats on both policy AND politics. REMINDER: That's what happens when the Hawaii GOP puts its faith in RINO's instead of real Republicans. Somehow, it still seems a shame that Fritz Rohlfing, Miriam Hellreich, Pat Saiki, Beth Fukumoto and the rest of HRP's RINO leadership haven't thrown Pine a going away party. Knowing Pine, however, she would have shown up wearing a Kirk Caldwell t-shirt and turned her farewell event into a rally for billions in higher rail taxes for HART so she can help reward all her campaign contributors for their generosity. Finally, let's bid farewell to former Republican Kym Pine. 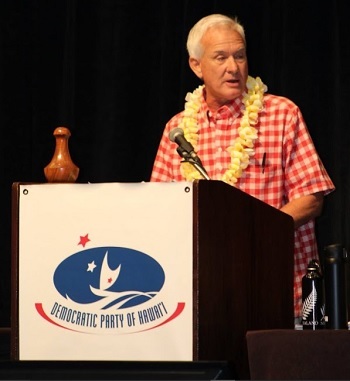 And let's say "Hello" to infamous former Democrat and convict Rod Tam whom Rohlfing and the Hawaii GOP are backing for State Senate. With Hawaii's GOP being such a wishy-washy Republican-In-Name-Only (RINO) organization, it's become extremely easy for politicians to slither back and forth from one side of the aisle without anyone really noticing -- like Aaron "Ling" Johanson and Beth Fukumoto. Yes, things are pretty bleak down at Hawaii GOP headquarters. For anyone who really cares about changing Hawaii for the better, it's the worst political party imaginable. Republicans and conservatives in Hawaii deserve much, much better. It turns out that Pine was only kidding about small government.